Yes I know it’s been running for centuries but for some inexplicable reason I’d never seen Les Mis until last night. It’s one of those shows that everyone seems to rave about. OK well almost everyone. 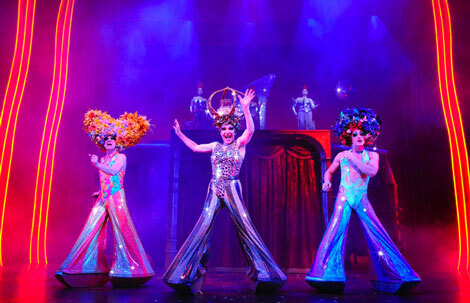 The friend-of-a-friend at Priscilla last night thought it was a snoozefest. So along I went to the Queen’s Theatre with an open mind and a smattering of anticipation. The latter probably due to the fact that the lovely and highly talented Jon Robyns has been part of the cast since last year. But what if my reaction to the show was inappropriate? Should I pop into Angels on the way down Shaftesbury Avenue and hire a couple of masks? If so, how would I know which mask I should be wearing? 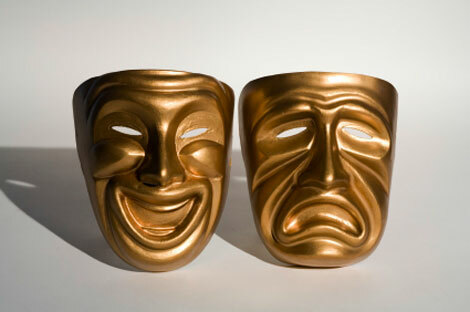 Is Les Mis the sort of show that starts with the right mask and ends with the left? Or is it just right mask all the way from curtain up through to the train journey home and bedtime? Three and a bit hours later as we stumbled through a mild gin and vodka induced haze into the street (at the Queen’s Theatre the circle exits are at street level..how weird is that?) I still wouldn’t have known which mask to wear. I wasn’t very familiar with the music but it sounds great and looks great. David Shannon as Jean Valjean was very good with a beautiful voice. Also strong was David Thaxton as Enjolras and Jon Robyns didn’t disappoint. On the other hand, ‘I Dreamed a Dream’ was rather a hard and shouty affair. I can appreciate that Les Mis is an impressive show but would I go again? Hmmm. Sorry Les Mis fans, but it just didn’t light my fire. The huge stiletto heel at the front of the Palace Theatre is a bit of a clue that this is not Les Mis. After years running in Australia, the movie-turned-into-a-musical has hit the West End. The star of the show is of course Priscilla the bus. 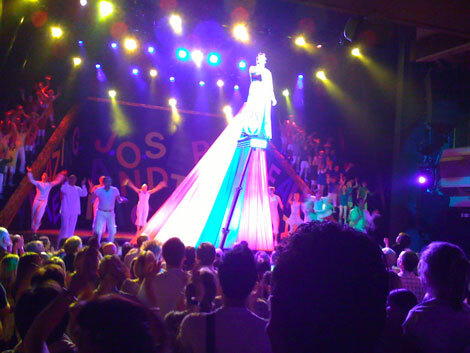 She’s 8m long, dominates the stage and is covered in LED lights. Inside are 3 lifts and an interior that looks like an Early Learning Centre. Tony Sheldon is superb as Bernadette, the transexual who unexpectedly finds love in the outback. Jason Donovan is OK but rather bland as the drag queen on a trip to meet his son and Oliver Thornton makes for a convincing dippy and shallow Adam. The rest of the company put in solid performances and the three divas that hover above the stage are a lot of fun. The set and costumes are as extravagant and inventive as you’d expect but it just feels a bit half-baked, clunky and lacking in pace at times. The sheer size of Priscilla means she can only move slowly around the stage and that drags the show down a bit (sorry couldn’t resist). There’s a bizarre scene at the start of Act 2 where the Aussie locals in the outback have a hoedown with members of the audience dragged up (oops I did it again) on stage. Did I miss summer? Is it panto season already? The last time I saw Jason Donovan on stage was in Joseph at the Palladium. Now there was a show with amazing energy, great lighting and earth shattering sound. I was expecting a similar thing with this production – to be swept away with it all but it never happened. The sound is average and the lighting in particular was very disappointing. It was terribly flat at times, the rear cyc was underused and the operatic travelling scene could have been far more striking with some lighting animation. Maybe there was no budget left after all the frocks? Don’t get me wrong, I did enjoy the show and there are some great moments but I left feeling a bit disappointed. All the ingredients are there but a little bit of theatrical magic got lost on the road from screen to stage.